Pet hair on the couches, on the carpet, and in the air is the scourge of most pet owners. Cleaning up fur can feel like a constant battle in your home. Prevent pet hair in your house with these four tips. 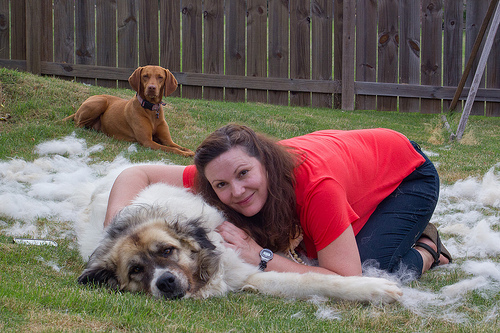 If you find hair all over the place rather than just on your dog, improve your grooming game. Get a brush that’s appropriate for your pet, and take time each day to brush your furry friend. Do it outside or in the garage in order to prevent that hair from getting loose in your home. Regular grooming will decrease the number of hairballs that your cat hacks up, and you’ll even get some quality time with your pet. If your dog or cat prefers petting to brushing, try tackling the fur problem with a grooming glove instead. Since cats are pretty good at grooming themselves, you don’t need to bathe them very often. In fact, they only need a bath when they become especially dirty, sticky, or smelly. For dogs, however, a weekly bath can help with excess fur, especially when you use a high-quality shampoo that prevents shedding. These shampoos are nondrying and help remove loose hair while promoting a healthy coat. In addition to brushing your pet every day and bathing your pet once a week, consider taking your pet to a professional groomer. Not only will having your pet professionally groomed reduce the amount of fur in your home, but also groomers can help your dog by cleaning out clogged ears, trimming nails that are painful to walk on, and ridding your dog’s coat of matted hair. Think of how refreshed you feel after a massage, a facial, or a pedicure. Getting groomed does the same thing for dogs. It makes them feel pampered and refreshed, resulting in a happier dog. You can also ask your groomer to recommend the best brush for your dog’s fur type. For optimal health, you should plan to take your dog to a groomer once a month. Pet hair and dander can easily enter your HVAC system’s vents and ductwork. When your heating or cooling system turns on, these substances can circulate through your home’s air supply or build up in the ductwork. Removing pet hair from your furniture and carpet is a great way to reduce airborne contaminants, but your standard cleaning routine won’t eliminate fur and dander entirely. Have your HVAC system professionally cleaned by a company like Air Control Heating and Cooling Inc. to stop pet hair and dander from circulating through your home. Though getting rid of pet hair may feel like an unending battle, continue to be vigilant. Be sure to brush your cat or dog once a day, bathe once a week, and groom once a month, and you’ll see a lot less hair covering the surfaces in your house. Have your HVAC system cleaned twice a year, and you’ll experience a substantial improvement in your home’s air quality.